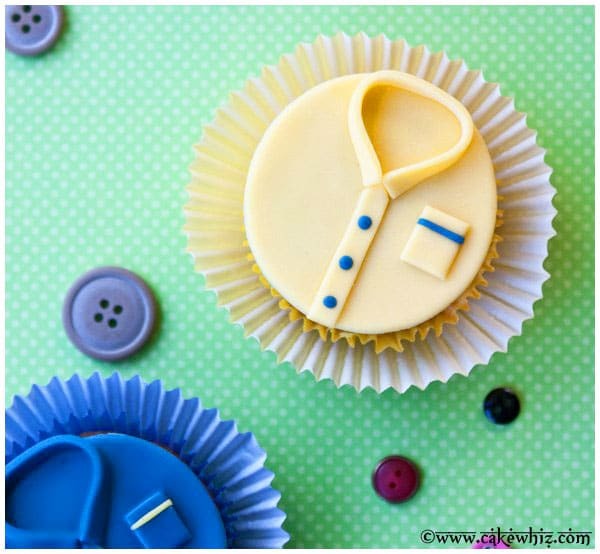 Use this step-by-step tutorial to make quick, easy Father’s Day shirt cupcakes with fondant. These are the simplest Father’s Day cupcake decorations ever! Father’s Day will be here soon and I made these EASY Father’s Day shirt cupcakes to celebrate! A few years ago, I made a round shirt cake with this same design and it’s still one of my most POPULAR cakes. I used homemade marshmallow fondant to make these little Father’s Day shirt cupcakes. I topped them on vanilla cupcakes with buttercream icing BUT if your Dad is a chocoholic, use this recipe for vegan chocolate cupcakes. You can make these Father’s Day cupcakes in your Dad’s Favorite colors. Also, this is a really EASY cupcake decorating tutorial that’s perfect for BEGINNERS. You DON’T need any special tools or cutters. 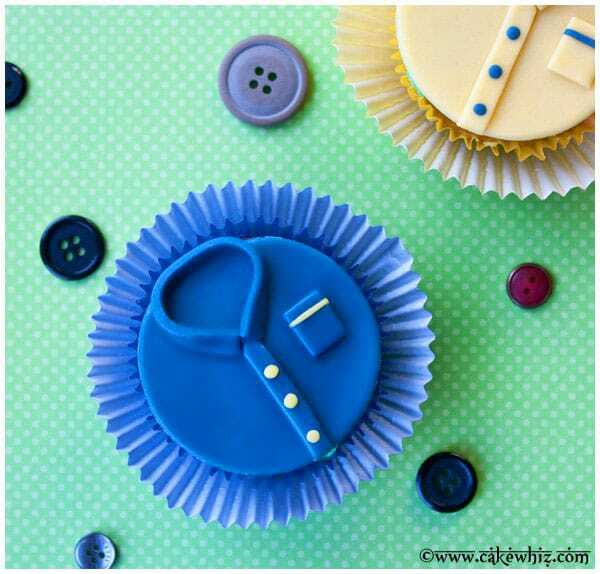 This is also one of the SIMPLEST Father’s Day cupcake decorations ever! How to make Father’s Day cupcakes? How to decorate Father’s Day cupcakes? Follow along my TUTORIAL below. Start off by cutting out a circle fondant piece. The, add details like buttons and pockets with smaller fondant pieces. Stick everything together with a bit of water. Let the toppers dry and then use them on your cupcakes. 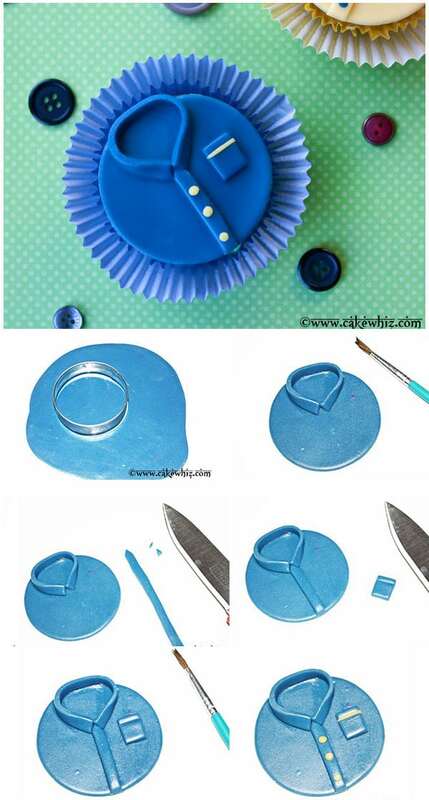 Roll out blue fondant and cut out a circle piece, using the circle cutter. Use a pizza cutter to cut out two thin strips. These will become the collar and button line of your shirt cupcakes. Use a paintbrush to brush some water around the top of the circular piece. Stick one of the strips, as shown below. You can stuff some tissue in the center of the collar so that it holds its shape. Now, use a knife to cut off the ends of the other strip so that it becomes pointy. Brush some water along the center of the shirt. Stick the pointy strip here. Cut off excess at the bottom with a knife. Now, cut out a small rectangular piece and use the knife to make a light indentation on the top. This will become the pocket of the shirt. Brush some water near the side of the shirt and stick the pocket piece here. Finally, roll out three tiny yellow fondant balls and press them onto the button line. Also, roll out a very thin yellow strip and press it along the top of the pocket. Tip: You can draw the buttons and draw that pocket line with edible markers, if you like.